Artistically impressive doesn't equal informative — Practical Reporting Inc.
As Stephen Few and others have written about on various occasions, representing data in a visual way can serve a variety of purposes, one of which is to create art. As they also point out, though, it’s important to keep in mind that “data art” is a fundamentally different animal than the visualizations that most of us create as part of our work. One is designed to inspire an audience, or challenge them, or have some other impact on them that good art can have. The other is designed to communicate quantitative information in the most straightforward and informative way possible. Yes, it is possible for data art to also communicate quantitative information in a straightforward and informative way, but it often doesn’t because, ultimately, that’s not its main purpose. Beautiful? Gorgeous? I think so, too. Useful? Informative? Not so much. If the purpose of this visualization is to inspire us to think broadly about how the U.S. really is—and has always been—one big melting pot, then I think that it accomplishes that goal magnificently, and I suspect (hope?) that that’s the goal that the designers had in mind. If, however, its purpose is to enable us to notice patterns, make comparisons, and spot useful insights within this data, i.e., to be informative, I’d consider it to be a failure. For example, we can see that immigration from Asia increased over time, but we can’t really say much more than that about it. Has it been a steady increase? How many people immigrated from Asia in the 1990s? Was it more or less than the 1980s? How did Asia’s increase compare with that of Latin America? Even very basic questions such as how the total number of immigrants from all regions has changed over time are nearly impossible to answer with any kind of accuracy. 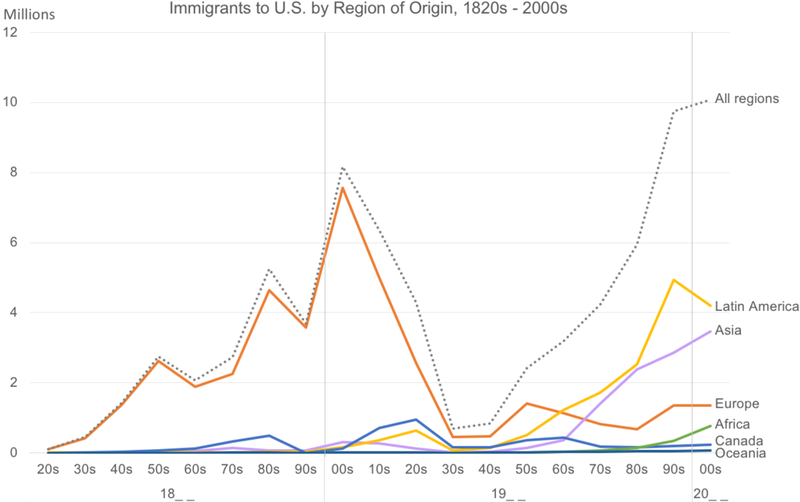 Immigrants from all regions plummeted in the 1930s and 1940s, perhaps because of isolationist U.S. policies in effect at the time. Until about the 1910s, virtually all immigration came from Europe. The post-war spike from Europe in the 1950s is a lot smaller that I would have expected. Immigration from Canada spiked following each major U.S. war, with the exception of the Vietnam War. How many of these insights did you notice in the original graph? Even once you know that these insights exist, are you able to spot them easily? As I also mentioned, I’m not suggesting that it’s impossible for a graph to be both artistically impressive and informative. A graph can be both, although these tend to be rare because they require a combination of skills that few people possess (and I’m not one of those people since I don’t have a visual arts background). I am saying, though, that we shouldn’t make the mistake of assuming that, because a graph is artistically impressive, it must also be informative. That’s often not the case.